Autumn, a fairy with a big heart. My first introduction to skepticism, as I know it now, was through reading “FlimFlam” by James Randi. My brother had sent me a copy as a gift, after I had a particularly troubling episode with a paranormal believer. I had no idea there were people called “Skeptics” that weren’t grumpy old men complaining about how “In my day they really knew how to make a cup of coffee!”. “Flim Flam” was the perfect introductory book for me to read. There is an ongoing argument about what is the “perfect” book to give someone you wish to introduce to skepticism and critical thinking. The usual winner in these arguments is “A Candle in the Dark” by Carl Sagan. While it is a very influential and classic work, it would not for me have been the “perfect” book. I am the type of swimmer that drives some people crazy. I go to the lake cabin where I live every summer and slowly ease myself into the lake. I start with part of my big toe, work up to the entire toe, and eventually to on to the entire leg. It takes about 10 minutes but I am finally in the cold lake water swimming and having a good time. My daughter Evelyn is a “run as fast as you can and JUMP IN” type of swimmer. I understand the “get the cold over with as quickly as possible theory”, I can not practice it. I was the same when I was learning about skepticism. I didn’t have the ability to throw up all my beliefs and at the end of a book go “well boy I was wrong about everything! It was for me less painful to adjust step by step to critical thinking. It didn’t take long until I was happily splashing around in the lake of skepticism, swimming alongside those able to change all their bad beliefs to good skepticism in one giant leap of faithlessness. When I see someone struggling with critical thinking or perhaps spending too much money on an astrologer, or even worrying if their home is haunted, I find giving them a book helpful along with gentle advice. “Flim Flam” worked for me, so that is usually my book of choice. It should be noted for children in their early teens I often start with a Joe Nickell book. I always think Joe was one of the Hardy boys when he was younger. I think “Flim Flam” works well as a “gateway” book because it starts with the Cottingley Fairies. 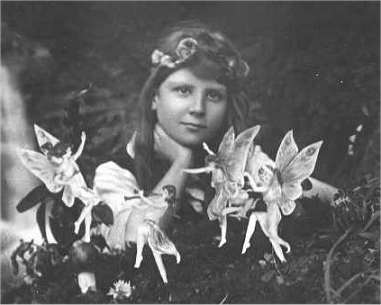 The Cottingley Fairies were seen by two cousins, Elsie and Frances in England in 1917. The fairies are perfect because they are so obviously fake. Time and photoshop have taken away belief in the photograph by everyone except the most die hard delusional fairy fan. This is important, as even the most gullible non skeptic will not feel threatened by a skeptic treatment on the subject of the fairy photographs. A non skeptic can read, with some surprise, how even Sir Arthur Conan Doyle supported the authenticity of the photographs. It’s laughable to look at the photographs and imagine anyone could believe for a moment they were real. Yet people did. Randi disproves the photographs and the reader learns just what critical thinking is all about. However, Randi is not disproving the existence of God, or if homeopathic medicine works, or if your Aunt Matilda really did see a UFO. He is showing up critical thinking skills on a subject that is not controversial. No one reading the first part of “Flim Flam” is going to slam the book shut and shout “Well this is just insulting to me!” No one is going to mentally shut down their brain because the book is attacking a long held belief. It’s a gentle, but very complete, introduction to how a skeptic thinks and investigates. You are learning something, it’s that big toe is going into the lake. Before too long, the rest of you is going to follow. “Flim Flam” is also an interesting read. You keep turning the pages and you begin to root for the downfall of these charlatans. Randi’s personality translates well onto paper. People that meet James Randi adore him, but they also soon learn he’s an honest and good man. He’s not a skeptic for the money, that’s for sure! Reading “Flim Flam” people begin to like the man that’s written the book as they read it, because Randi is not blaming the victim, but protecting the victims of these Flim Flam men and women. The book is not dry and dull, which is an image the word “skeptic” conjures up. Instead Randi conjures up skepticism as fun, interesting, important and exciting. (It might be he conjures so well since he’s a magician). While “Flim Flam” is my recommended first step into skepticism, it is certainly not the last book any new skeptic should read. The list of must read books, from Richard Dawkins to Carl Sagan, is long. I found myself fascinated with skepticism, something I knew little about before reading “Flim Flam”, and was soon reading any skeptic book I could get my hands on. When thinking of a book for your non skeptical friend or family, think if that person is a jump in the lake or a ease slowly into the lake type of person. Don’t scare someone off with a book that’s too much for them to handle. I have a friend that is now an ex- Mormon. He was sent to Germany for his Mormon year of service. He had to go door to door trying to convert people, and was told “Don’t mention they have to give up beer the first visit!” This is one time I recommend skeptics take advice from the Mormons, don’t mention giving up beer the first visit (or book!). Take it slow, and you’ll find people will listen. The best part is, to be a skeptic (unlike a Mormon), you don’t have to give up beer!